Do the Star Creature boys ever take a holiday? One of the most consistent labels of modern time delivers yet another certified dancefloor filler thru team all star, Shiro Schwarz who, joined by the amazingly titled Zackey Force Funk, shows us just how construct an effortlessly cool G-funk boogie jam! "Take The Wheel" is an appropriate title for this hydraulic-rockin' beast, as you'll be too busy with your hands out the sun roof doing air triggers to bother steering! 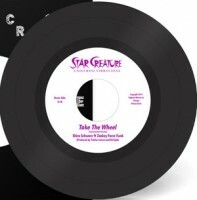 As often the case with Star Creature, we get both vocal and instrumental versions; with each a truck-bumpin', bifter-sparking slice of LA funk as incendiary as anything else on the market (ps. don't miss that last outro section...fyyyre!! - ed).